Retrofit components are all rated to resist a certain amount of earthquake force. 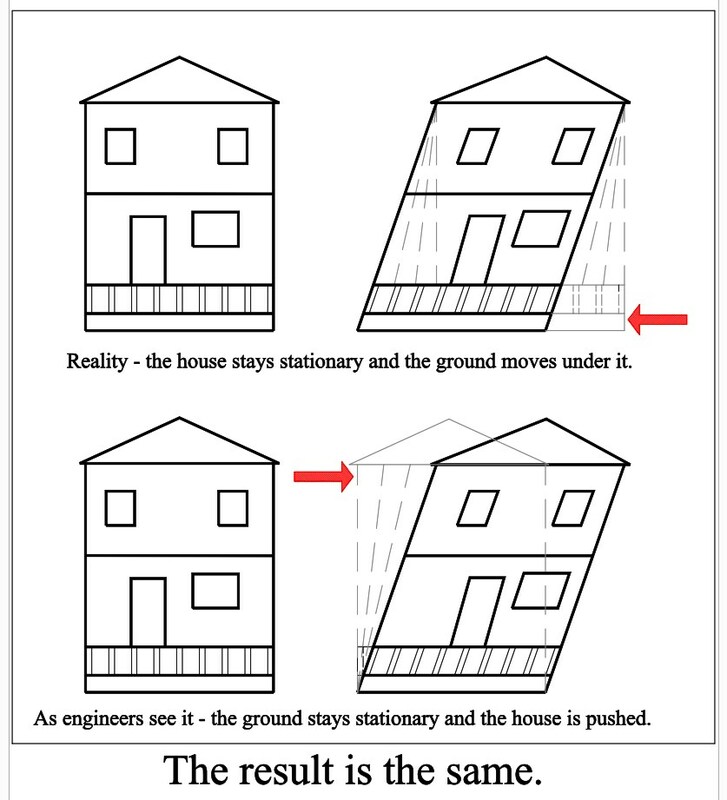 Figuring out how much force that will be is the purpose of seismic retrofit engineering. After figuring out the amount of force to resist it is a matter of installing enough retrofit components to resist that amount of force. Doing less than that and there is potential for failure, more than that and you are wasting your money. Let’s look at this table from a manufacturer’s catalog and see that it tells us. Reading from left to right the hardware model is a GA1, it requires (4) 10d (a nail with a certain diameter) nails that are 1 1/2 inchs long. F1 means a lateral, as in earthquake force, direction. Next is the interesting part. DF/SP means this only applies to Douglas Fir (DF) and Southern Pine (SP). In the column where it says Floor (100) you see the number 235. This means this hardware can support 235 pounds of floor weight. In other words, if you have a floor that weighs 235 pounds you would need one of these to hold it up. For Wind/Seismic we are told it can resist 330# which is considerably more, because it will only need to resist a lateral force for a short period of time versus for a continuous period of time when holding up a floor. Earthquake Resistance Chart from Standard Plan A. Even though all the capacities without exception are wrong, this table should give you an idea of how this information is helpful. 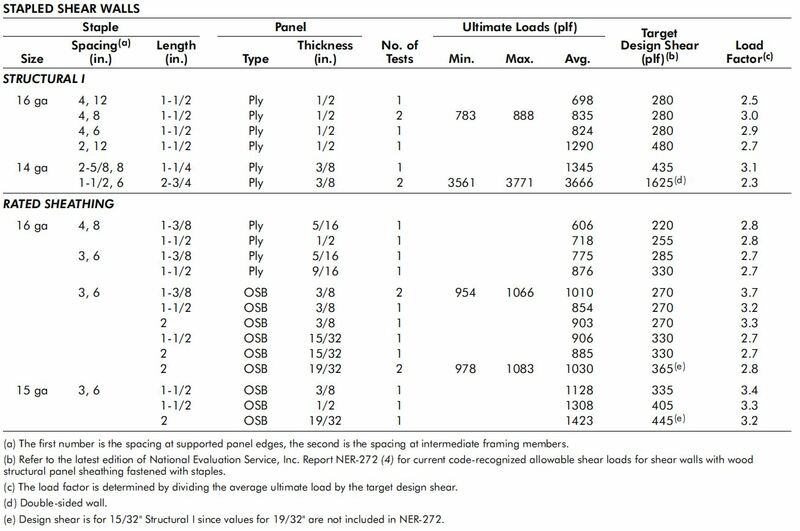 For example, according to this table a 5/8 bolt can resist 1170 lbs. 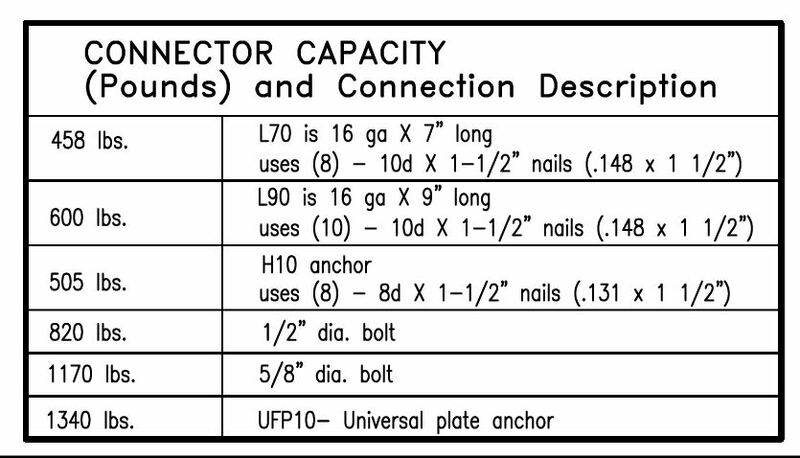 of earthquake force, and H10 anchor (a type of shear transfer tie) 505 lbs. etc. 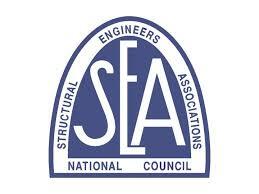 Below is a listing of various types of fasteners and hardware with their earthquake resisting capacities. DO NOT rely on these values. I cannot guarantee their accuracy. URFP10 1530 POUNDS in redwood or Douglas Fir. Depends on nailing pattern, bolt sizes, number of shear transfer ties, and quantities. These must be calculated. 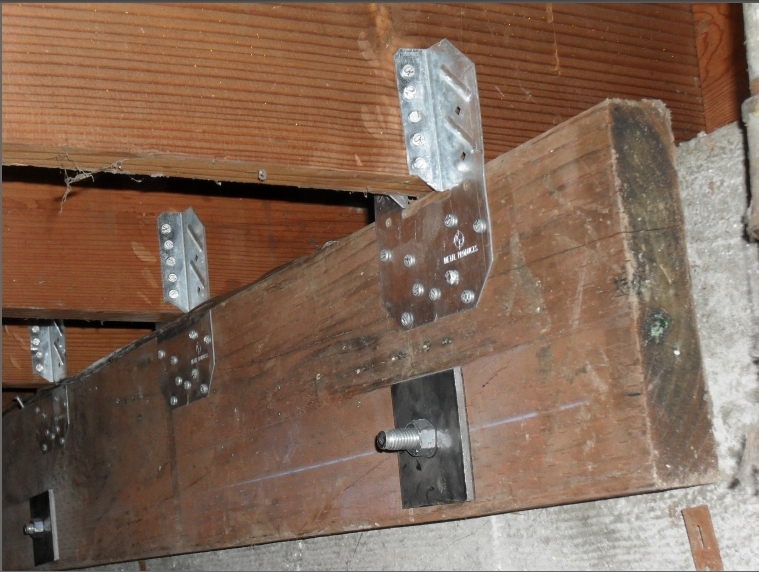 NEW MUDSILL ATTACHED TO THE SIDE OF FOUNDATION AND ATTACHED DIRECTLY TO FLOOR JOISTS WITH SHEAR TRANSFER TIES. CAPACITY IS DEPENDENT ON NUMBER OF BOLTS AND SHEAR TRANSFER TIES. 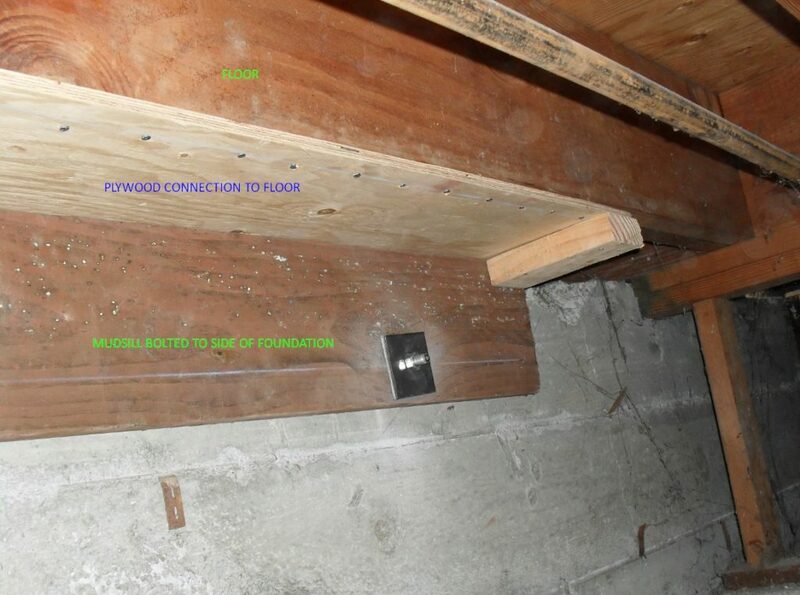 NEW MUDSILL ATTACHED TO THE SIDE OF FOUNDATION AND ATTACHED TO A FLOOR JOIST. CAPACITY IS DEPENDENT ON PLYWOOD NAILING, FRAMING METHOD, AND NUMBER OF BOLTS. 8d nails 3″ apart = 550 pounds per linear foot. 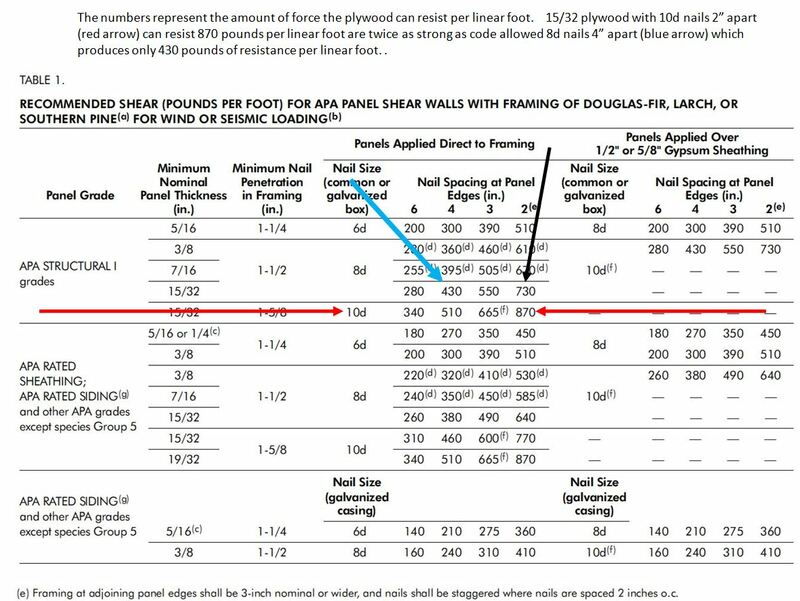 8d nails 2″ apart = 730 pounds per linear foot. 10d nails 2″ apart = 870 pounds per linear foot. 3 rows of nails with 3/4 inch plywood makes a shear wall that can resist 1800 pounds of resistance per linear foot.